Darwinian fitness – The rate of increase of a gene in the population, this is difficult to measure. It describes the capability of an individual of certain genotype to reproduce, and usually is equal to the proportion of the individual’s genes in all the genes of the next generation. If differences in individual genotypes affect fitness, then the frequencies of the genotypes will change over generations; the genotypes with higher fitness become more common. This process is called natural selection. Survival value – Survival value is how a form of behaviour contributes to survival. For example the removal of an eggshell to prevent predation, how will this affect the survival of the organism within the egg shell? Early removal of the egg shell removes the stimulus of the egg shell which is a sign to predators that there is food available (the egg) for them to eat, however the early removal of the egg shell means that the young will be underdeveloped and are less likely to survive. Also in certain species of gulls this leaves the newly hatched gulls prone to cannibalism of each other, in this species of gull the parents remove the shell after 30 minutes the chicks hatch. This is also an example of a trade-off. Trade-off – A trade-off is a situation that involves losing one quality or aspect of something in return for gaining another quality or aspect. It implies a decision to be made with full comprehension of both the upside and downside of a particular choice. In terms of animal behaviour, these aspects are different behaviours. See the above example. Optimal foraging theory or the optimal patch model is the exploitation of resource patchiness. Food tends to be clumped which gives rise patches of food/resources. If we think of Tt as the travel time between patches and Tp as the time spent in the patch we can begin to develop optimal patch model. More time spent per patch means more energy used for foraging, as prey numbers in the patch decrease, less time spent in the patch means relatively large amounts of time will be spent on travelling. This is the basis of the optimal patch model. 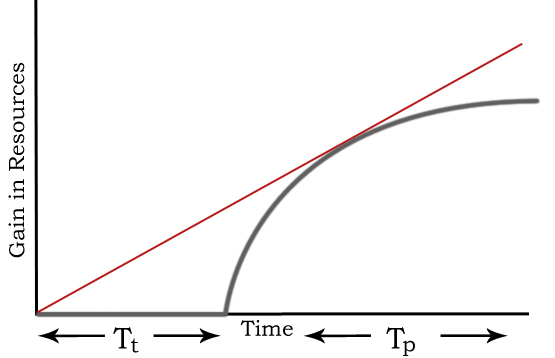 The optimal patch time (the optimal amount of time spent in the patch) is when the gradient (energy gain) is at a tangent. At this point any further time spent in the patch will not produce sufficient energy gain from prey as the prey resource has decreased. It is now more efficient to move onto the next patch. When the distance between patches increases, the time spent in the patch for efficient energy gain also increases. We can see this by using the graph, as the travel time increases the gradient becomes less meaning it reaches a tangent at a later point. This later point is the optimal patch time. This is a benefit to the organism because of the increased travel time between patches which require more energy; due to the increase in energy requirements it is more beneficial to remain in the patch for a longer period of time to extract more energy from the resource i.e. Consume more prey.